Although undoubtedly special effects will dazzle in a newer version since Blu-ray clarity enhances some flaws from Cliffhanger's '93 technical wizardry, viewing Renny Harlin's film again in the best possible version since its seventeen year old theatrical run proves it hasn't lost its ability to thrill. Having helmed the first sequel to Die Hard, from the moment Cliffhanger begins, you're reminded of what a stellar period the late '80s to mid '90s were for action films because they didn't rely too heavily on computers to achieve effects that could be done with stuntmen, invention, and thinking outside boxes that people hadn't even invented yet. 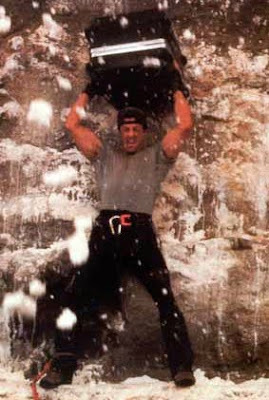 An important cinematic stepping-stone for Sylvester Stallone who had wrapped what we assumed was the last Rocky movie but had yet to find his footing yet post-Rocky or Rambo, in its '93 release Cliffhanger reminded us just what set him apart as an action hero. 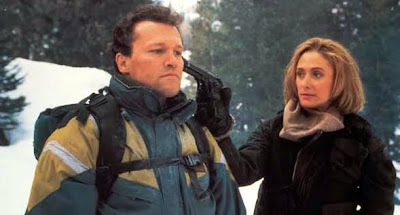 After walking away from the disastrous '92 comedy without laughs, Stop or My Mom Will Shoot, Stallone climbed the Rockies (or really the Italian Alps) under the guidance of Harlin and alongside co-stars Janine Turner, Michael Rooker, and John Lithgow. 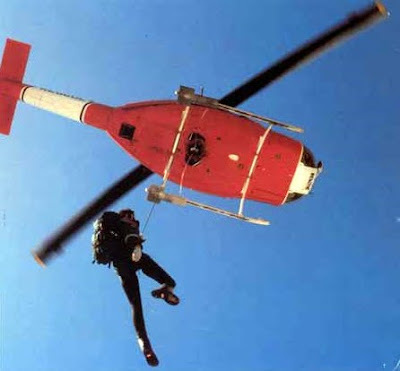 And while it's easy to spot some of the doubles and shots that were filmed separately as the color changes when we see the men on the mountains verses Janine Turner flying the rescue chopper, Harlin's perfectionist mindset and desire to obtain as much reality as he can in the way the stunts were carried out helps set the movie apart from the pack. Aside from some of the extreme violence, the shot choices, edits, and masterful execution is always spot on, which can be evidenced right from its uneasy introduction. 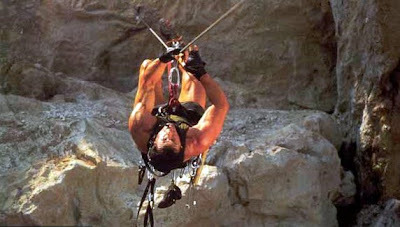 Falsely setting up the movie's tone as a jokey Top Gun styled action comedy complete with Stallone's obligatory line that he's "just hangin' out" on the edge of a mountain, we're in for quite a surprise when the tone shifts into dark, urgent territory that's usually approached in the third act of an action film. 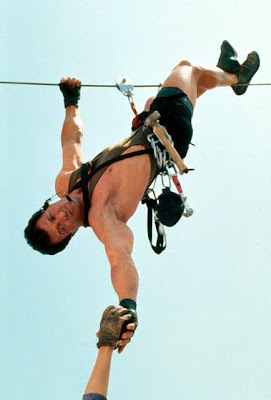 What begins as a routine rescue shifts when something goes horribly wrong when Michael Rooker's girlfriend slips from the hanging upside-down one armed grasp of his rescue colleague Stallone's hand and plummets to her death. 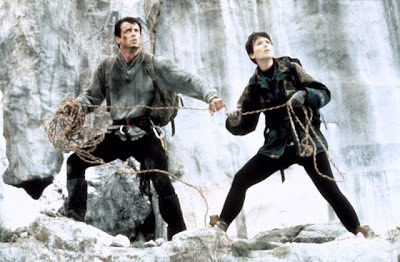 With an audience that wasn't quite used to seeing heroes fail to save the damsel in distress, the opening of Cliffhanger-- which still made me jump seventeen years later-- ensures us that we aren't in the era of '80s superheroes without capes but regular blue collar heroes who doubted themselves like their movie descendants from the '70s. 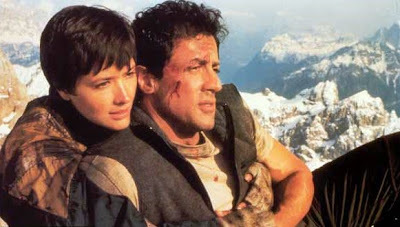 Guiltily retreating from both his long-time girlfriend Jessie (Janine Turner playing a character who seems like a close relative to the pilot she portrayed on TV's Northern Exposure) and his best friend Rooker, Stallone returns a year back in the hopes he can persuade Jessie to leave the Rocky Mountains and start a new life with him elsewhere. 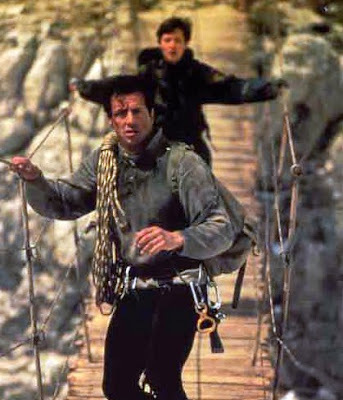 Lecturing him about his cowardice and betrayal in ditching them when they needed him the most, eventually Stallone's climber ends up meeting Rooker in a near deadly reunion on the edge of a cliff as Rooker lays into Stallone for the accidental death. Yet, the two have no choice but to work together, first out of duty as rescue workers and secondly as hostages when they're called into a fake emergency only to discover a group of ruthless criminals headed up by John Lithgow has stolen one hundred million dollars from the United States Treasury Department plane. Topping the opening intensity of the damsel's free-fall, Harlin presents an action sequence that's so complicated that it may very well be his very best considering how much of it was real and how much was edited together effects wise. Breathlessly paced, the the mid-air two plane hijacking of briefcases of cash involving double-agents, surprise heroes and villains is Harlin's '90s version of the O.K. Corral shootout by setting it at twenty thousand feet by mirroring the pounding of our own hearts in the rapid cuts as the criminals discover that there is no such thing as easy money. Creating the rest of the film's impossible plot, the plan goes so wrong that they crash land in one place and the three briefcases containing the money hit three completely different locations on the mountains as well. And obviously, since the Treasury Department is involved, the briefcases have three tracking devices contained inside, which necessitates Rooker and Stallone to be kept captive in order to play “fetch." 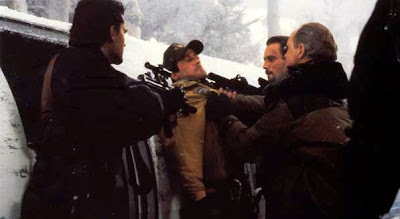 Sending Stallone up a mountain without his jacket as insurance and threatening to kill both when the money is retrieved, John Lithgow gleefully chews the snow off the scenery as the military trained criminal mastermind complete with an impossible to place over-the-top, only-in-the-movies accent that swings like a pendulum from quasi-British to Lithgow's impression of Peter Sellers' character Clouseau's boss Chief Inspector Dreyfus in The Pink Panther series. Despite some major gaps in logic and a few, “well, why wouldn't they...” hypothetical questions that make you question some of the events, it's an entertaining blast of a movie that shouldn't be in the works to be remade but nonetheless a new version is scheduled to hit screens in 2011. 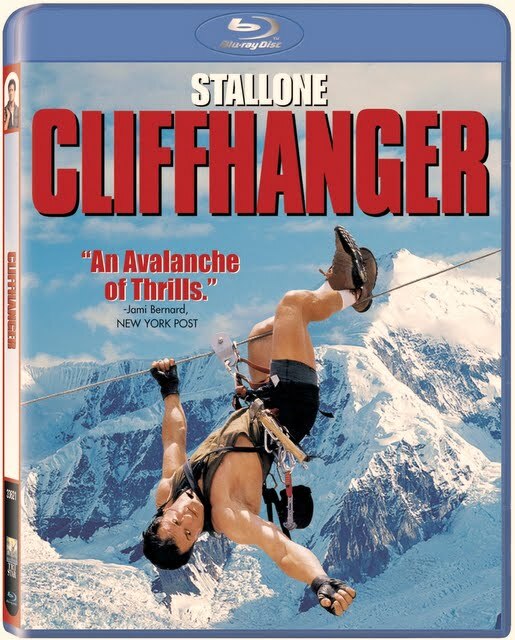 Yet, even by contemporary standards, Cliffhanger is at times still so outrageously violent that I can easily see why it was originally saddled with an NC-17 since it goes way too far in two fights in particular involving Cool Runnings actor Leon and another one with Rooker verses a UK soccer fan. 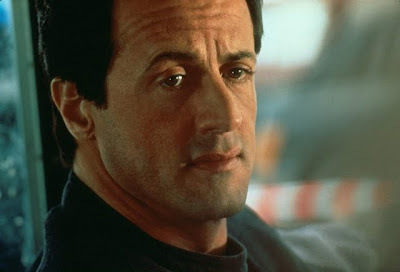 Co-written by Stallone, it's immediately apparent that he was truly at his peak in the film (no pun intended) as an aging but still remarkably handsome movie star whose life experience only added to the charisma we fell in love with in his earliest work. 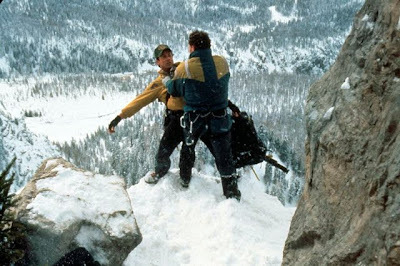 And while Cliffhanger was written off by some critics at the time as just "Die Hard on a Mountain" especially considering the tie with Harlin, the formerly forgotten film has become a guilty pleasure. Thankfully, in celebration of its loyal fans, Sony chose to enough numerous special features on the Blu-ray transfer including commentary tracks and behind-the-scenes bonus extras, some of which were previously available in earlier disc releases.